For those who are currently on the slopes of Vesuvius, there are a few events you might want to attend. Continuing the profitable collaboration between the Pomigliano Jazz Festival and the Apolline Project, today at 4pm the Roman Baths in Pollena Trocchia will be open to the public. The event will be followed by a jazz concert (free of charge) in Villa Cappelli (a remarkable nobleman's house of the mid-18th century with a fake Roman ruin in the garden and a real Roman altar). Similarly, next Saturday there will be a guided tour of the so-called Villa of Augustus in Somma Vesuviana, with particular emphasis on the wine cellar. The event will be followed by wine tasting with the local producer Cantine Olivella. On Sunday, at 7pm the young kids of the school "Ascoltando i bambini" in Pollena Trocchia will meet Caroline Lawrence, the talented author of the Roman Mystery Novels. 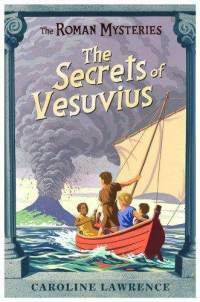 The students will recreate some of the key scenes of her book "The Secrets of Vesuvius" and will ask questions on the Roman cults. The event is organised by the Apolline Project.